Chelsea coach Maurizio Sarri was disappointed with his players after they needed a last-gasp goal to salvage a 2-2 draw against Manchester United. The Blues looked set to cruise to an easy victory when Antonio Rudiger headed them into a 20th-minute lead but two second-half Anthony Martial goals put United ahead. It looked set to be the perfect Stamford Bridge return for United boss Jose Mourinho but Ross Barkley grabbed an equaliser deep into stoppage time as Sarri's team maintained their unbeaten record. 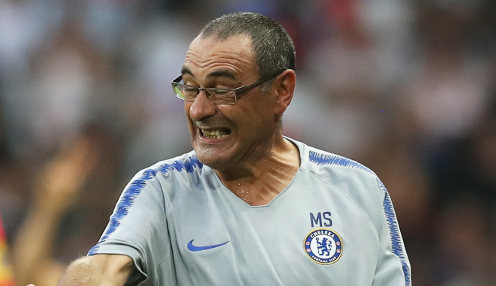 "I am very happy with the performance for 60 minutes because for 60 minutes we played our football," said Sarri after the match. "Then after the goal of Martial, we did not play our football. "For the last minutes United were better than us so I am very disappointed with the last 30 minutes. "They have to play my football with character...I don't want the long ball. I don't want to go for the second ball. I want to play with the short passes." Mourinho, who won three Premier League titles during his two spells with Chelsea, was involved in a scuffle with one of Sarri's staff after Barkley's goal but the Blues boss insisted it had only been a minor issue. "Of course I want to speak to him [the staff member] again because I want to make sure he's able to understand it was a big mistake. I will speak to him again tomorrow," he added. Chelsea are 1.10 to beat BATE Borisov in the Europa League on Thursday, a competition they are 5.00 to win this term.